Thirty-five years ago today was a Friday and, although a winter’s day, calm and not too frigid in the Delaware Valley. The daytime high soared to 55 degrees (Fahrenheit) before dipping to 26 at night. 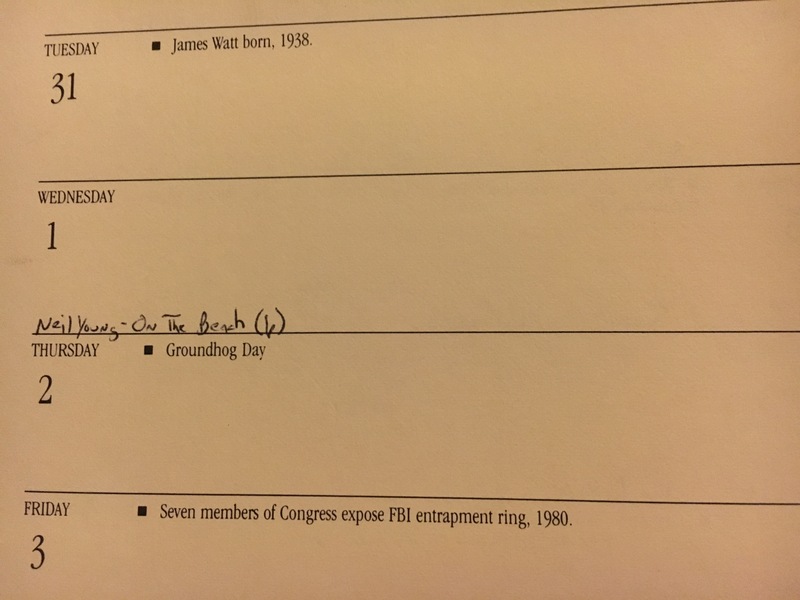 The New York Time’s summary of that day’s edition can be found here. A big pop-culture story unfolded after the issue was put to bed, however: While filming a Pepsi commercial that afternoon in L.A., Michael Jackson’s hair caught fire. What else? 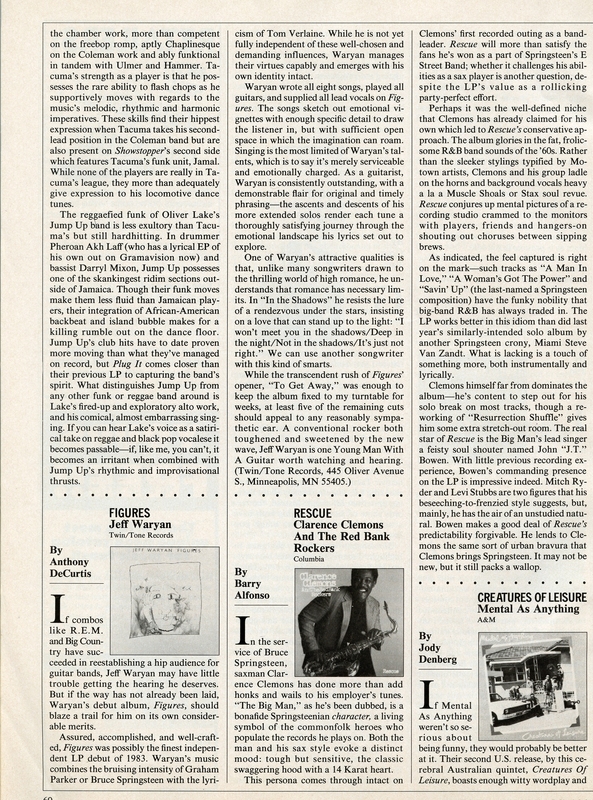 I recapped February ’84 (via Record Magazine) a few years back, so won’t go too in depth into the economic concerns of the era beyond to say that the early ’80s/Reagan Recession was beginning to ebb. A more major media milestone occurred on Jan. 22, 1984 during Super Bowl XVIII, which saw the L.A. Raiders trounce the Washington squad 38-9. No, not the game, but the debut of Apple’s famous “1984” commercial for the Macintosh personal computer. The following day, Jan 23rd, another historic event occurred: the Iron Sheik, who’d thumped Bob Backlund for the WWF championship the previous month, lost the coveted title to Hulk Hogan at Madison Square Garden. It was the first step in Vince McMahon’s masterful plan to take the WWF national. On the personal front: I was 18, attending Penn State’s Ogontz campus in Abington, and working part-time as an usher at the Hatboro Theater, a single-screen movie house that was destined to be demolished by summer’s end. Early in the month, I scored a temporary gig working inventory at the A&S department store in the Willow Grove Park Mall, and that extra cash helped fuel a month-long shopping spree – according to my Doonesbury-themed desk calendar, I picked up 15 albums and one single over the course of those 31 days. 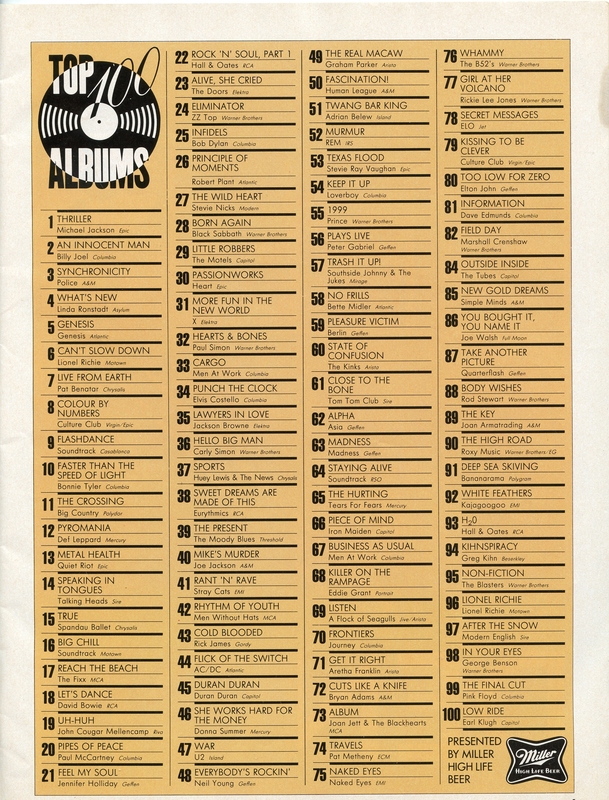 Most were purchased at Memory Lane Records, a used-record store in Horsham where the platters were plentiful and prices cheap, but two relatively new releases came either from the Hatboro Music Shop or the Listening Booth at the mall: the Pretenders’ Learning to Crawl and Billy Joel’s An Innocent Man. 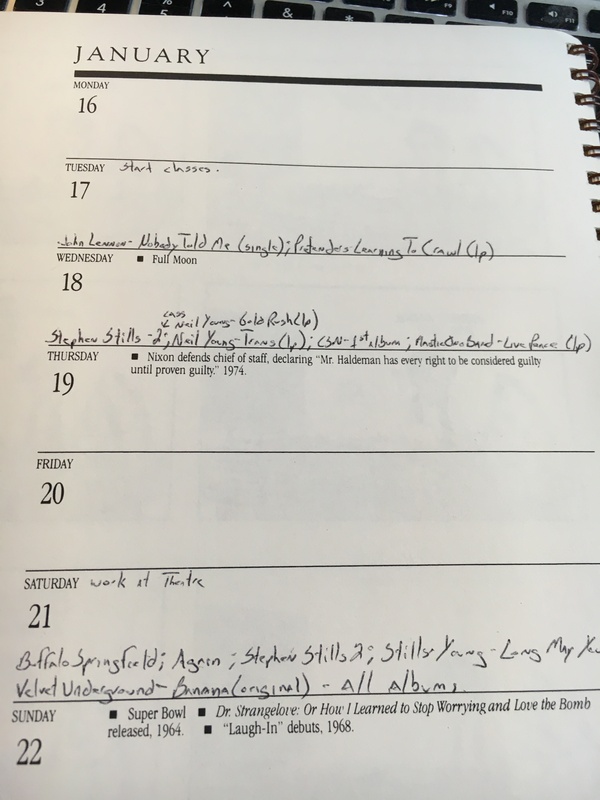 As evidenced by the picture, I was knee-deep into all things Crosby, Stills & Nash this month. In other words, I was out of step with the mainstream pop world – and not for the first or last time. 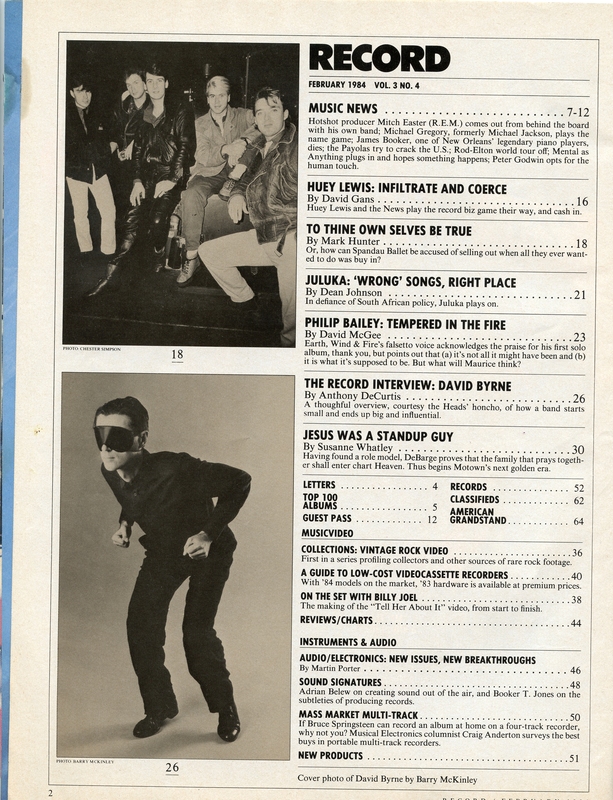 And, with that, here’s today’s Top 5: January 27th, 1984 (via Weekly Top 40)…Further Down the Charts. 1) John Mellencamp – “Pink Houses.” At No. 12 is this classic populist ode from the Heartland rocker – still one of the greatest such songs. 2) Van Halen – “Jump.” There’s no denying the utter joy of this single and its synth-driven riff, even if it was inspired by a man who was threatening to leap from the ledge of a downtown L.A. building. (“Go ahead and jump” was what Roth imagined people were yelling at him.) The group’s first and only No. 1 single was on its way to the top of the pop chart, rising in one fell swoop from No. 34 to No. 20. 3) The Pretenders – “Middle of the Road.” It’s no surprise that Learning to Crawl was one of the two new LPs I picked up this month. I’d argue that it encapsulates rock’s past, present and future in its four minutes and 15 seconds, but I’m sure others would disagree. Anyway, this week it edges up to No. 21 from No. 25. 4) Nena – “99 Luftbalons.” The success of this song in both its German- and English-language incarnations speaks as much to the Cold War concerns of the era as to its catchy beat. On its way to No. 2, this week it floats to No. 22. 5) The Motels – “Remember the Nights.” Martha Davis & Co. never quite caught on as much as it seemed they might, but they did release a handful of classic tracks. This, the third single from their 1983 album Little Robbers, clocks in at No. 36. 6) Irene Cara – “The Dream.” The theme song from D.C. Cab inches up to No. 39 from No. 41. It follows the “Flashdance…What a Feeling” blueprint – though it doesn’t capture the same euphoria, it’s still a fun listen. Thirty-three years ago, in February 1984, America was stumbling out of back-to-back recessions that almost hammered the American Dream flat. The unemployment rate for January was 7.9 percent, which is high – but better than the 10.3 percent of January 1983. In fact, the unemployment rate for 1983 as a whole was, according to the St. Louis Fed, 9.5 percent – the same as it was in 1982. (The Bureau of Labor Statistics has slightly different numbers – 9.6 and 9.7 percent, respectively.) The trend was headed in the right direction, however. Stories in the news included Michael Jackson’s hair catching fire while he filmed a Pepsi commercial on Jan. 27th; the cable networks A&E and Lifetime debuting on Feb. 1st; the first successful embryo transfer from one woman to another being announced on Feb. 3rd; the movie Footloose premiering on Feb. 17th; and Michael Jackson winning eight Grammy Awards (seven for Thriller and one for the E.T. audiobook) on Feb. 28th. New music releases for the month included the Footloose soundtrack; Thompson Twins’ Into the Gap; The Smiths’ eponymous debut; Queen’s The Works; The Alarm’s Declarations; and Van Morrison’s Live at the Grand Opera House Belfast. At the time, I was 18 and living the commuter-college life. 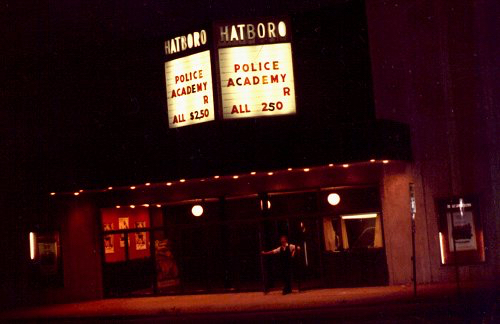 I lived at home, attended Penn State’s Ogontz campus and worked, worked and worked as an usher at the single-screen Budco Hatboro Theater – a fun job that I’d held since the previous summer. (That’s me in the doors in the picture on the left.) This month, however, the employees learned that it was destined to close at some point over the summer, as Budco saw the writing on the wall for single-screen palaces. The building was sold, torn down and a Wendy’s was built on its spot. My purchases for the month show where my head was at, beginning with Neil Young’s masterful On the Beach, which I picked up on Feb. 1st. 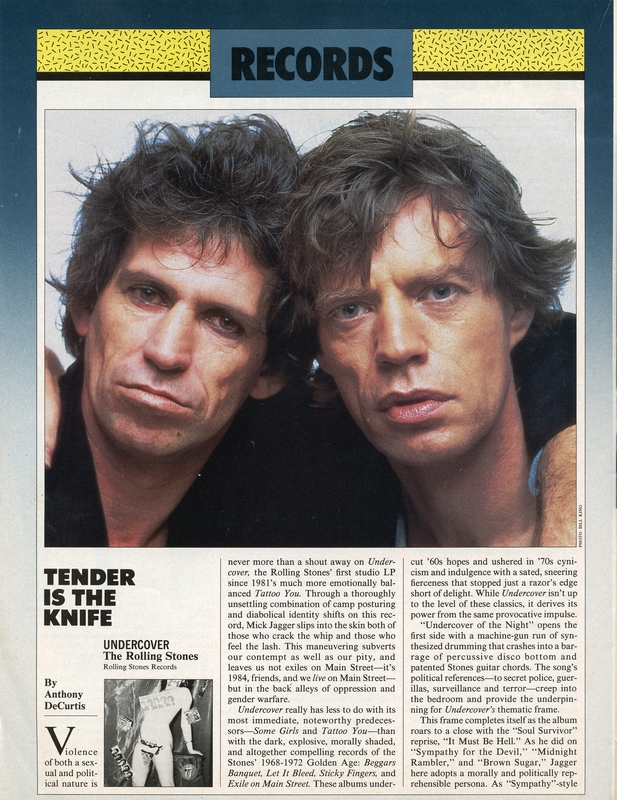 First, though: This issue isn’t one of the magazine’s best. 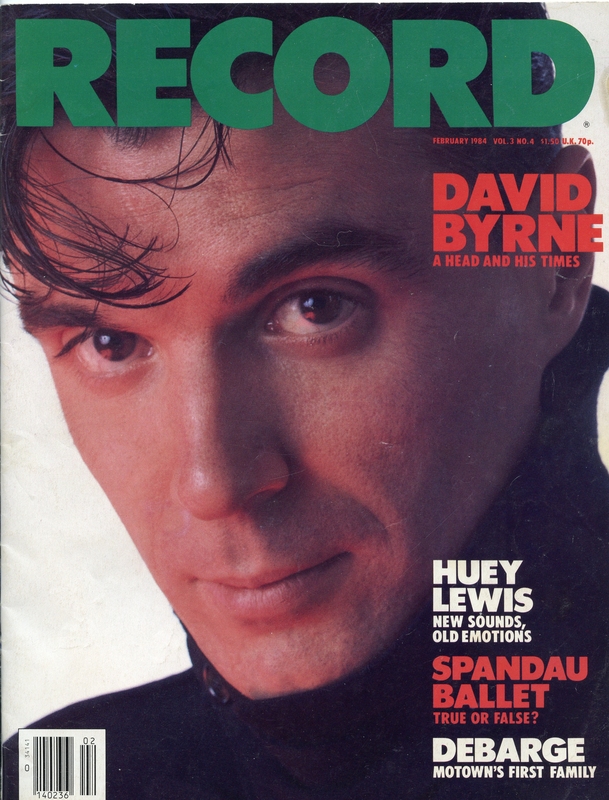 I wasn’t a fan of David Byrne at the time (I’m still not), and never read the interview with him. I also never read the articles about Huey Lewis, Spandau Ballet, Juluka, Philip Bailey and DeBarge. So why choose this month? Because of On the Beach and Manassas. When I saw both in my old desk calendar, well, how could I not go with this month?! 2) Paul McCartney – “Pipes of Peace.” This, the second review, goes to show the delay that once existed between release and review. 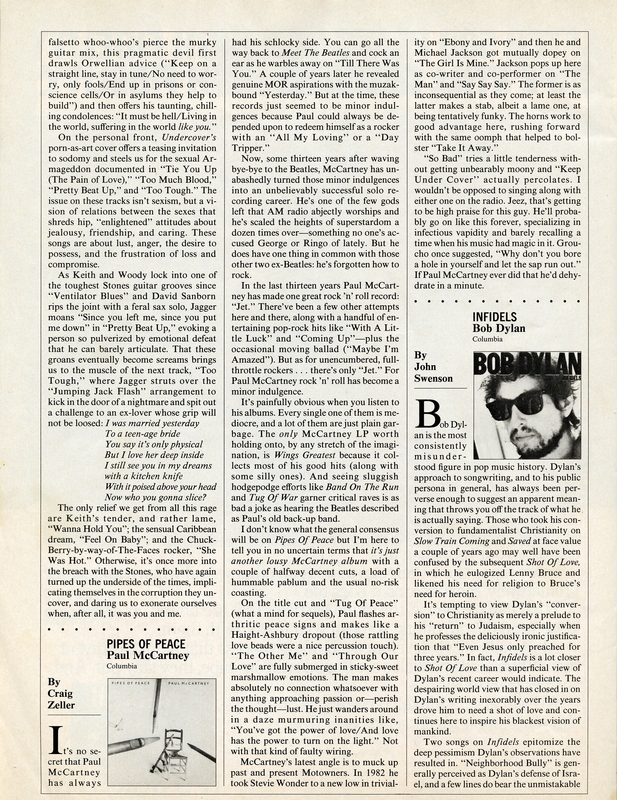 The February issue of Record would have been on newsstands by early or mid-January, I’m sure, but Pipes of Peace had already been out for at least two months by then, as it was released in October 1983 (as I write about here). 3) Bob Dylan – “Sweetheart Like You.” I’ve been in something of a Dylan mood of late, having listened to The Freewheelin’ Bob Dylan, The Times They Are a-Changing, Bringing It Back Home, Highway 61 Revisited and the Bootleg Series Vol. 9: The Witmark Demos 1962-1964 this week, with Freewheelin’ and BIBH both receiving twin spins. But, though I know his ‘60s output as well as most, and bought Slow Train Coming in 1979, by the time the decades turn to the ‘80s… I’m admittedly ignorant. There are a few albums I’ve bought and liked, and a few I’ve bought and disliked. Which is likely why I turn to his ’60s oeuvre whenever I have a hankering to hear him. 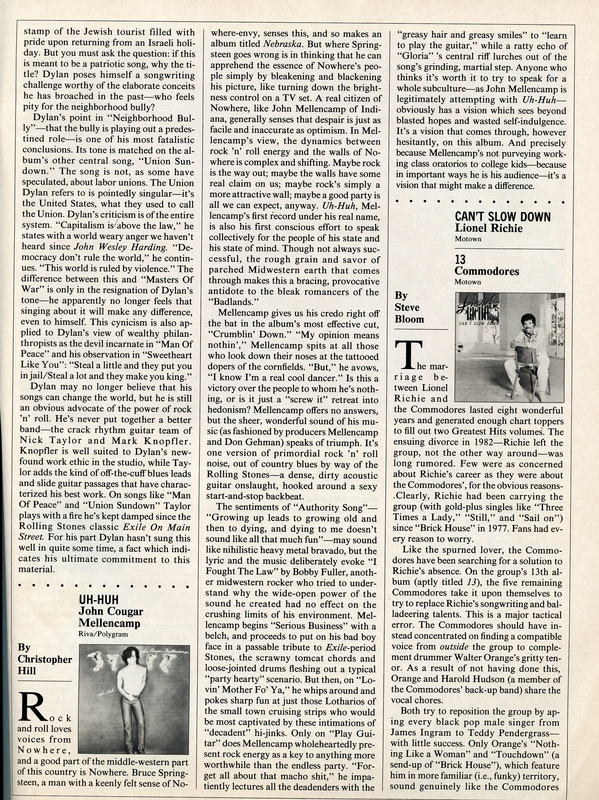 Anyway, of Infidels, reviewer John Swenson opens by saying that Dylan “is the most consistently misunderstood figure in pop music history” and closes with “Dylan hasn’t sung this well in some time, a fact which indicates his ultimate commitment to his material.” In between, there’s a lot that makes me want to check out the album, which I may well do in the coming week. 5) Clarence Clemons and the Red Bank Rockers – “A Woman’s Got the Power.” Anyone from the Delaware Valley circa the late ‘70s and early ‘80s likely remembers the A’s – at least, anyone of a certain age who, regardless of whether you were old enough to get into the clubs, listened to Philadelphia’s two main rock stations at the time, 93.3 FM WMMR and 94.1 WYSP. The homegrown rockers were routinely plugged and played on both, as they should have been – they were damn good. 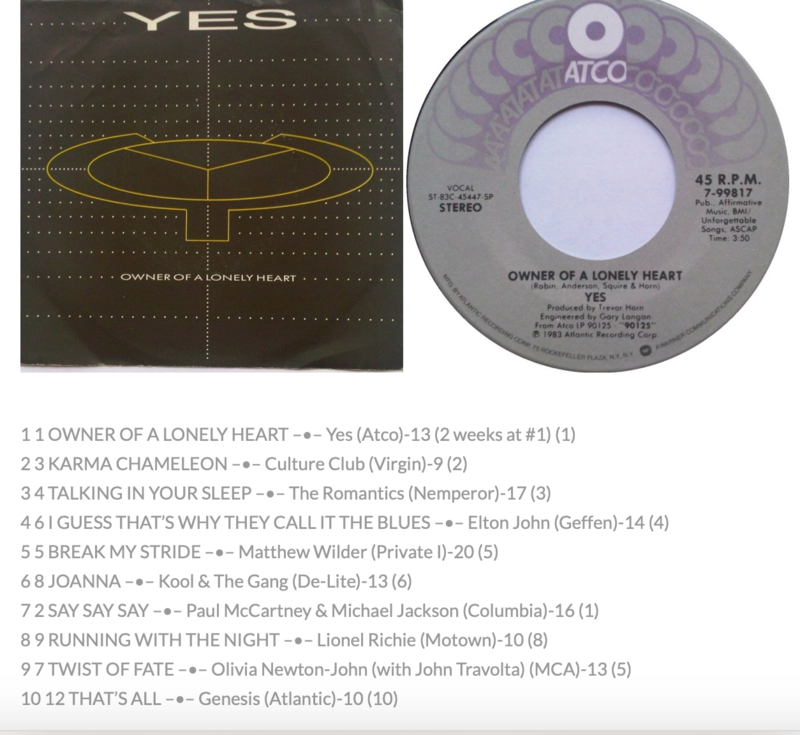 And this song, which was the title track of their 1981 album of the same name (their second and last on Arista), was played to death – as I remember it, at any rate.